What is an Israeli Settlement? Why have Israelis built these communities? Because God Called His People to “Settle the Land”. Judea and Samaria is the Biblical name for the center of the Holy Land also called the Mountains of Israel. The media refers to this area as the “West Bank.” The residents of these areas, otherwise referred to as “settlers” are fulfilling prophecy and pointing the way for the rest of the Jewish people back to their roots. It is a city, town or village established by brave, Jewish pioneers in the Land of Israel. The early Zionists established kibbutz and moshav settlements in the Galilee and the Negev. 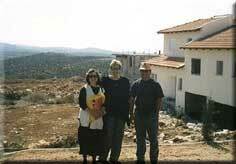 Since 1967, settlement activity has focused on the biblical areas of Judea and Samaria. In most cases a settlement community is established on a barren rocky hilltop where no one had lived for thousands of years. In some cases, such as Shiloh, communities are established on the original site of an ancient Jewish city. In others such as Hebron and Gush Etzion, a Jewish community is established on the site of an older community destroyed by Arab armies during or just prior to Israel’s War of Independence. How does a Settlement Get Started? The first commun ities were established in the 1970’s as small military outposts that were later turned over to families who committed themselves to live and develop the land for security purposes. Others began with a nucleus of families in tents or caravans (mobile homes), laying the foundations for what later became residential communities or cities. The larger urban communities were developed as a result of careful government planning and support. In all cases, the Government of Israel authorized and encouraged the creation of the community, lending assistance for infrastructure and development. With the exception of some of the newest neighborhoods, all communities have built permanent housing and public buildings, including schools and synagogues. Some communities are structured as an agricultural “moshav” where the common work benefits the whole community; others, called “yishuv”, are more like suburban neighborhoods in the USA. All have day care centers to assist working parents. A community can be as small as twenty families or large enough to have a university and industrial park. The Biblical region of Judea and Samaria was given to Abraham, Isaac, Jacob and their descendants, forever, 4000 years ago. Because of sin, disobedience and lack of belief, most Jews were driven from the land around 70 AD. However, there were always some Jews living in the Land and Jews around the world have prayed to God three times a day, each day, to return His people to Zion. The prophets foretold the ingathering of the exiles and the rebuilding of the Land in the latter days. (Ezekiel 36, Amos 9 to mention a few). In 1948, Israel was reborn as a sovereign nation and in 1967 the “West Bank” was reunited with the rest of the nation in the prophetic, miraculous Six Day War. Although Jordan occupied Judea and Samaria for 19 years and Egypt occupied the Gaza Strip during the same period, there was never any attempt to form a Palestinian State at this time. The land remained barren until the Jews returned to cultivate it. This is truly the fulfillment of prophecy. Why does CFOIC support the people of Judea and Samaria? In 1993 and again in 1995, Israel transferred significant territory to the Palestinian Authority, in accordance with the Oslo Accords. Israel entered into this so-called peace process in the hopes that territorial withdrawal would ultimately bring peace and prosperity to an area that has known so much killing and bloodshed. Many political and religious leaders, however, warned that the withdrawals ran counter to God’s plan for the Jewish nation and would only weaken Israel in future confrontations with her enemies. Christian Friends of Israeli Communities (CFOIC Heartland) was established in 1995 in response to the Oslo Process. Christians around the world were deeply troubled by Israel’s major territorial concessions and felt drawn to the people that stood on the forefront of Israel’s territorial battle – the people of Judea and Samaria. CFOIC provided a much-needed vehicle for Christians to become better informed about events in Israel, particularly with regard to the Jewish communities in the heartland of Biblical Israel, to visit these areas and become personally connected to the people living there, and to provide practical support for vital community needs. CFOIC Heartland is not an evangelizing ministry, but rather aims to build bridges of love and mutual respect between Christians and Jews. CFOIC Heartland brings unconditional support to the Jewish communities and partners with the dedicated pioneers of Biblical Israel to fulfill Biblical prophecy. Request your complimentary copy today!